I just got the sanction for a 10 day vacation and wanted to make the most of it – and returning by air was the only way to optimize my days at home. I spent time pondering on various travel websites looking for cheap options to return from home. Airfares were quite over the roof for the date I wanted, and had almost decided to book a bus. I was shocked seeing bus fares around the same range as air-tickets. After spending some more time searching for tickets, I zeroed in on Indigo 412 – which had a late evening departure (2050hrs) and was selling for ₹2399 (the lowest for that date). I selected a free seat and option for the advance check-in option as well. Days flew by, and I was on the last date of my vacation – like everybody, I had a heavy heart and longed to spend some more days at home. Sometime around 11AM, my paternal grandmother passed away, and I had to cancel the trip. The funeral got over late in the night, and I planned to take a day-time bus for my return. Since I slept quite late in the night, I woke up only by around 10AM. The day buses were gone. I was pondering on “what next” by now. I wanted to reach Bangalore by 5-5.30AM max. The options were quite limited for my requirements, and the ones which did that were awfully priced. An evening Kerala RTC Super Deluxe had some seats available – and that bus normally reaches before 5AM as well – but then I thought twice if I should take the risk of taking a Super Deluxe again (the memories of my last Super Deluxe ride wasn’t very pleasant). I desperately checked for air fares – and all of them were selling above 4.5-5K, which was way beyond my budget. Sometime in the afternoon, I was finalizing on a late evening bus which goes to Hyderabad via Bangalore, when I thought of checking the Indigo website once again – I was bowled over to see a ticket for Rs. 1999 for flight #412, which leaves at 2050hrs. Without much thoughts, I just hit the book button and confirmed my journey. Interestingly, I got the same seat (#8A) as my cancelled trip. I had an early “dinner” and left home sometime around 1900hrs. My brother was at the wheels – traffic was a bit heavy in the initial few kilometres, giving me a bit of tension. Traffic eased up after Parur and my brother let the beast loose. I was dropped at the airport at around 1945hrs. The domestic terminal of Cochin Airport is always sleepy – all the action lies at the international terminal, thanks to the middle-east boom in Kerala. Once inside the Terminal, it looked like I walked into an airport at peak hour – there were lots of people around baggage screening and even more people waiting outside the check-in gates. There were 6 check-in counters open for Indigo – I hadn’t done a web-check-in this time, and hence headed to the last counter – which had absolutely no queue. The agent at the counter smiled as she took my ticket printout and politely asked for my ID proof. She printed out my boarding pass – and I got the same seat that I selected online. This time, the security check wasn’t empty – there were a couple of people ahead of me. The guards there were very friendly – they assisted people in getting trays and putting their laptops on it. I cleared security check quite fast, and was in the terminal area by 2005 hrs! The seating area was quite full this time. An Air India flight to Delhi was just departing, while a Jet Airways flight was boarding (that was an international departure). Sometime around 2007hrs, just after the AirIndia to Delhi was pushed back, I saw my aircraft taxiing into the apron. The aircraft parked right outside our boarding gate, and passengers were de-boarding very quick. The first boarding call was made at 2015hrs – but they did not let the passengers move to the aircraft until around 2020hrs. I was inside the aircraft by 2022hrs. The aircraft was VT-IFS, an Airbus 320 with sharklets delivered in August 2013. 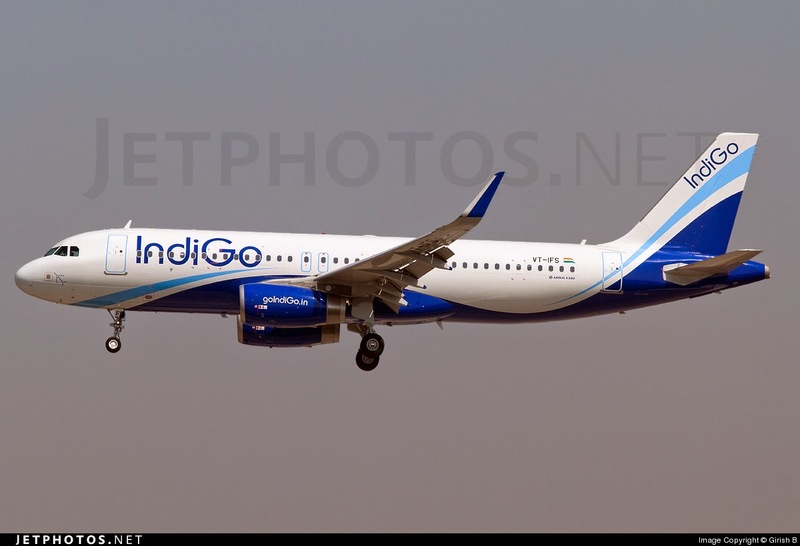 I am a fan of Indigo’s livery, and love their simplicity. Me and my family has had very positive experiences with Indigo, and was actually looking forward to fly with them again. And, Indigo doesn’t seem to indulge in the cut-throat fare wars and still have fairly good loads. Coming back to the trip, the purser was at the door welcoming all the guests with a smile. There were three other attendants who were standing along the gangway equally spaced from each other – they assisted passengers in leaving their hand-baggage in overhead bins and directing passengers to their seats. The aircraft was flying to Hyderabad via Bangalore and hence there were two sets of passengers – one bound to Bengaluru and another to Hyderabad. There was one huge family from Andhra – who had their seats strewn around – the attendants had quite a task to settle them down – and to add to the confusion, there were three kids, who cried all the way from Kochi to Bengaluru! Some confusion between the ground staff and the onboard crew about the number of passengers delayed our departure – it was later solved, and we were finally pushed back at 2053hrs – three minutes delayed. After being pushed back, we had to wait for the taxiway to be vacated by another Indigo aircraft which had just arrived from Mumbai (and would head to Chennai later). By now the safety demo had commenced – they were playing a pre-recorded announcement, which was quite clear and audible. They also gave an introduction to their “Hello 6E” on-board catalogue, which listed a lot of buy-on-board stuff including stuff like aircraft replicas, toys and snacks. We started taxiing at 2059hrs – we were to take off from the distant Runway #27. The taxiing take quite some time to the holding area. We had to wait until a SpiceJet Q400 (coming in from Hyderabad) landed (at 2107hrs). We finally took off at 2109hrs, from Runway 27. Daytime take-offs from Runway 27 are marvelous – my first flight journey was from this very airport, and we had taken off from Rwy27 as well! The aircraft took off straight to the west, and banked to the right, slowly executed a “U” turn and flew towards the North-East. The sky was quite clear, and there was no turbulence through-out. The seat-belt sign was turned off soon, and the buy-on-board service began. They first prioritized passengers who had pre-booked a meal. A lot of passengers had booked their meal, and the progress was quite slow. I did not buy anything, and decided to grab a sub after landing at Bengaluru. Landing was announced at 2141hrs. By now, the marvelous city of Bengaluru was visible – we passed over a couple of major roads which had traffic blocks (this confirmed we were flying over Bengaluru). We flew to the east, turned around and approached Bangalore from the east. We touched down at 2149hrs on Rwy27. Sadly, we were delayed! As we taxied to the apron, I saw a flurry of activity on the ground – a lot of 6E ground buses and crew vehicles were running around – I saw an Ashok Leyland terminal bus rushing towards a gate – the busfan in me hoped we get that Leyland bus. But, Alas! The aircraft went and stood near an aerobridge – and we got a gate with an aerobridge!! By the time the aircraft stopped, there was a mad queue inside the aircraft with people hurrying to get off. I remained seated till most of the crowd got off – my co-passenger was continuing to Hyderabad. I joined the alighting queue as the crowd thinned. 6E agents standing on the aerobridge welcome us with a smile. It was a long walk from there to the exit gate. The first lot of bags from our aircraft reached the belts just as I reached there – I had only hand-baggage. Once out of the airport, I headed straight to Subway, grabbed a sub and headed to the intra-city bus terminal. BMTC needs to be commended for the great job they are doing with the bus service. Albeit expensive, the buses do a great job in taking passenger to the city without burning a very big hole in their pocket. I was confused about which bus to take – but later decided to take the first one that leaves. I got into KIAS-9 – which was leaving first. This bus goes to Majestic. I got a seat towards the back of the bus – and I got a 2 seater all of myself. I was dropped in Majestic a minutes before midnight – and had pre-booked a cab from there to home. I was at home by about 25 minutes past midnight.